Korean tech giant Samsung is rumored to be on the cusp of shutting down Milk Music two years after introducing the streaming service, leaving some to speculate on a potential acquisition or partnership with Jay Z brand Tidal. Citing sources familiar with the matter, Variety on Friday reported Samsung is close to announcing a major development related to its streaming music efforts. While an exact timeline remains unknown, the publication said the company could reveal a partnership or purchase of a "major streaming provider," likely signaling an end for Milk Music. 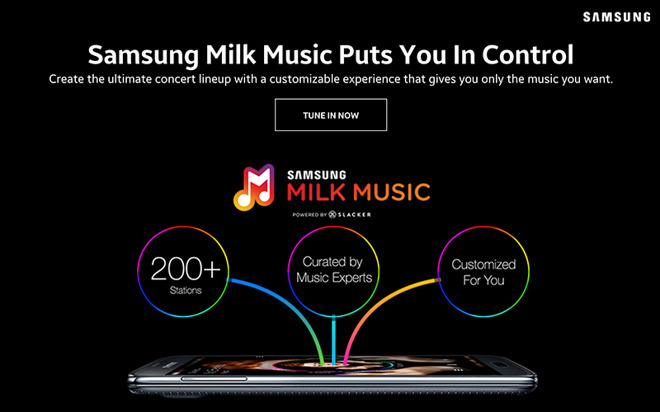 Samsung is apparently unsatisfied with Milk Music—and the erstwhile Milk Video —after spending significant capital on building out, marketing and maintaining the streaming service. Executives are looking to "clean house," citing poor returns and low paying subscriber numbers, the report said. "A lot of people in the organization have left or are shifting positions," a source told Variety. "There are lots of empty desks and cubes there." Milk Music launched in 2014 as the first offering in a multi-pronged attack on the multimedia streaming market. Samsung later debuted Milk Video, but a tepid response from subscribers forced the company to scale back plans that called for an expansion into sports and other categories, according to the report. Samsung is reportedly not planning to exit the streaming industry altogether, however, as the company is rumored to be in talks with Tidal over a potential partnership. Tidal owner Jay Z visited Samsung's campus last October and is said to have rekindled discussions in recent weeks. An acquisition is not out of the question, but the report notes Tidal could be asking for more than Samsung is willing to pay. Apple recently launched its own streaming music service in Apple Music, a product backed by iTunes' vast song library and human-curated playlists. In February, the iPhone maker said Apple Music reached 11 million paying subscribers. Update: A Samsung representative, speaking with AppleInsider, has gone on record as saying rumors of a Tidal acquisition are false.